Chilly winter weather is here to stay. The morning started off with just 4 degrees. My mother bought black fingerless gloves for me, true market trader stylee, & despite my low reservation with it in the trend-o-meter rating, I must admit it was a welcome piece of garment! Just goes to show, ‘mother knows best’ right? – – – – – The trade went smoothly enough. My truffles went quickly. Huge help came from two girls looking for something to take to a dinner party & bought a huge quantity of the caramel ganache truffles coated in tempered dark chocolate. – – – – – One bit of sad news of the day was that a local couple who had been buying my Tarte Tatin every morning say they are moving from the area, & next week they will buy my Tarte for the last time… – – – – – One bit of bizarre moment was when the girl with a Halloween mask & orange bucket asking around for treats was still loitering the market four hours later & I realized that, hey, that ain’t an innocent Halloween anymore, it’s ‘begging’! There is the Jam making – I have 41 empty jars waiting to be filled… The labels are designed & I have done numerous product tests to perfect the technique. So far I have only made & sold three jars (Strawberry jam with a tablespoon of Kirsch cherry liqueur). But when it comes to actually making more, I have no time to spare & it’s always on the back burner… Or maybe my fire for it has watered down now that I have satisfied ‘the need to know’, like ‘been there, done that and got the T-shirt‘. Another plan is to serve Hot Chocolate (in French they say Chocolat Chaud – somehow French language sound so beautiful…). I know some people think it’s a sweet drink for children, but This drink is thick, rich & truly the ‘food of the Gods’ (which is the translation of the Latin name for Cacao). When it’s cold like this, hot chocolate is bound to go down well. So what’s stopping me? 1. I need to purchase a drinks dispenser. We’re talking £500.00 just for this. 2. I have no electricity. I need to buy a portable generator – The cheapest I have found is £60.00 on ebay UK – which is probably the wrong model for my type of usage. Apparently they are noisy & I have no idea how to use it. And it’s operated by fuel?? Wouldn’t that be smelly for my chocolates & cakes? I wonder what price people would pay for a cup of takeaway hot chocolate? £1.50? £2.00? I don’t think no more than that. And besides how many cups would I need to sell before I see the returns? Since I will never be able to serve this drink on my stall, please make & drink this at home instead! I have a fantastic recipe for Hot Chocolate. 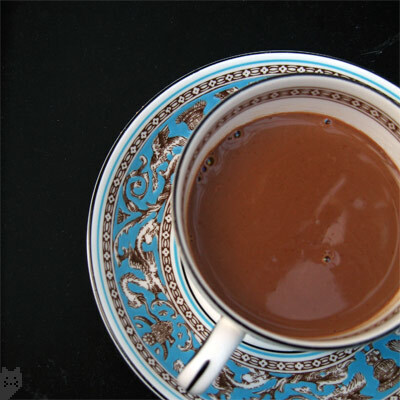 It is dark, rich & thick, it is like drinking liquid ganache, & is for adult consumption. Ideally be served in a cup, not mug, or a nice porcelain demitasse cup. Rule of thumb is 1:5 ratio of chocolate & milk+cream liquid. You can vary the thickness of your drink by how much double cream you put in it, in substitute of milk. 1. Simmer milk & cream in a pot. 2. Pour (1) over the chocolate in a bowl. 3. Whisk & melt the chocolate. 4. Return the mixture to the pot & heat. 5. Whisk until preferred consistency. 6. Strain the liquid (with a tea strainer) in to a pre-warmed cup. You can infuse the milk (step 1) with spice such as: cinnamon stick, grated nutmeg, vanilla pod, cloves, chilli… Or what about a dash of Triple sec (means ‘Triple distilled’ orange liqueur) like Cointreau? Experiment & create the original cuppa. … For super indulgence, if you have raspberries, you can place a couple in the drink to fall to the bottom of the cup for a nice surprise at the end!